OPTIONAL: when citrus is abundant during winter, i add the zest of one small orange (cara cara, blood or navel), 1 1/2 tablespoons of freshly squeezed juice and orange segments to the salad. NOTE: this colorful, high fiber, antioxidant salad is a great accompaniment to grilled fish/shrimp tacos, simple black beans and guacamole! 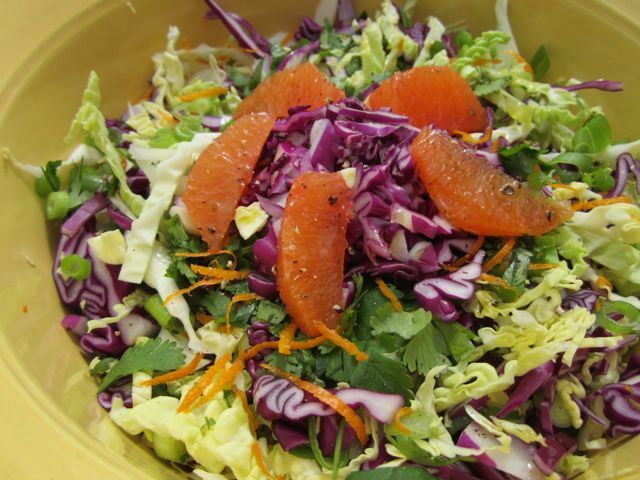 This entry was posted in salad and tagged antioxidant, cabbage salad, cara cara oranges, high fiber by elena. Bookmark the permalink.